I have three books for you guys today. 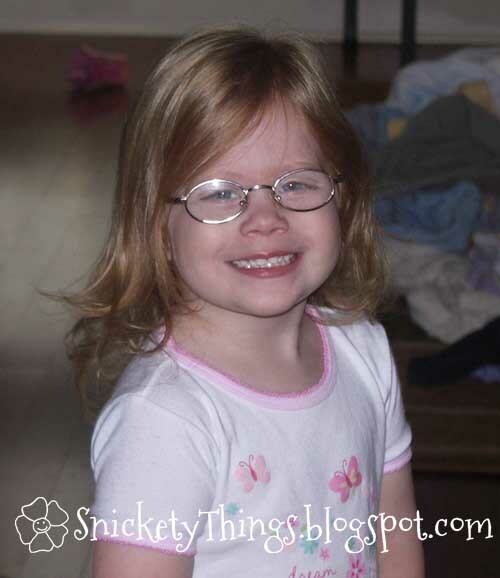 My oldest daughter wears glasses. She got them when she was two and the completely fit on the palm of my hand. We went through a lot in the beginning trying to get her to wear them, it wasn't easy. Here she is at three. Eventually she quit fighting us on them and just started wearing them. Here she is at four. That is until she started school last year. Ready for kindergarten at age five. You see, one of her classmates told her she looked ugly in glasses and that she didn't want to be her friend. The child even went so far as ripping the glasses off her face, bending them and scratching her in the process. As a mother this broke my heart and made me very angry. I know she needs glasses in order to see and I never wanted her to be teased because of them. Of course she told me she didn't want to wear them any more, but I had to try and convince her that she was still going to have to wear them no matter what people say. After comforting her best I could, I scoured the library to find some books that might help. I found two. 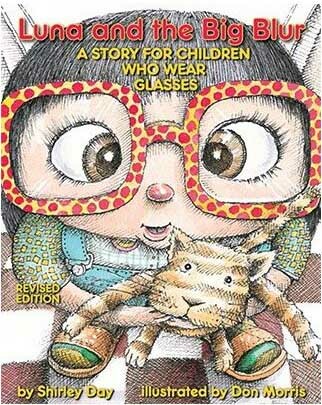 This book is about a little girl who has to wear glasses even though everyone else in her family does not. She doesn't like her glasses and doesn't understand why she has to wear them. After a dream that she no longer needs them she spends a day without. Things don't go well for her. The thing I really liked about this book is the section in the back for parents. It has a list of common vision problems for children and how to have your children actively participate in taking care of their eyes. It is not a short book and will have to be read to younger kids. Older children will also be able to understand the concept of the story when reading it on their own. I think this book is good for all ages of children. The Princess gives it two thumbs up, and a sense of satisfaction from her glasses. Boo says "Can I wear glasses?" (she doesn't need them). This is a really cute book about a Princess at Princess school. She is made fun of by the other Princess' because she wears glasses. She decides she doesn't need them and tries to go without with very humorous results. It has a wonderful ending that shows her the glasses aren't so bad. This book had more of an effect on my daughter because it was closer to her situation. At the end of the book my daughter was actually thinking her glasses were really great. 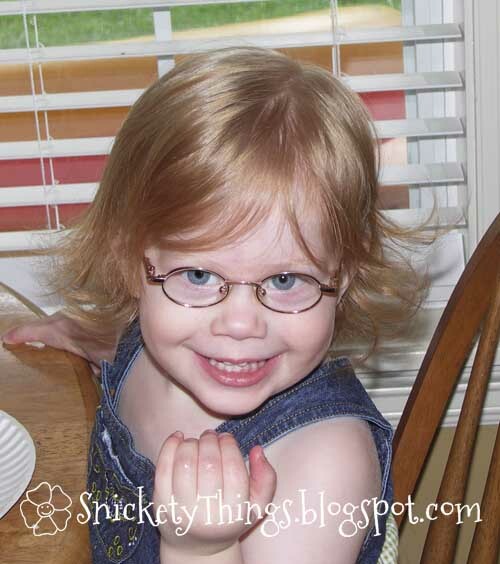 As a result, the new glasses she got shortly after were pink, just like in the book. I would give this book another half flower if I could for the way it made my daughter feel after reading it. This book is good for all ages. The Princess gives it two thumbs up. Boo still "Wants glasses." As the year wore on, my daughter stood up for herself some to the bully. She was still picked on, but she let it go instead of dwelling on it. Here she is at six. It is hard to tell, but those glasses are pink. I was very excited when I found this book last year. 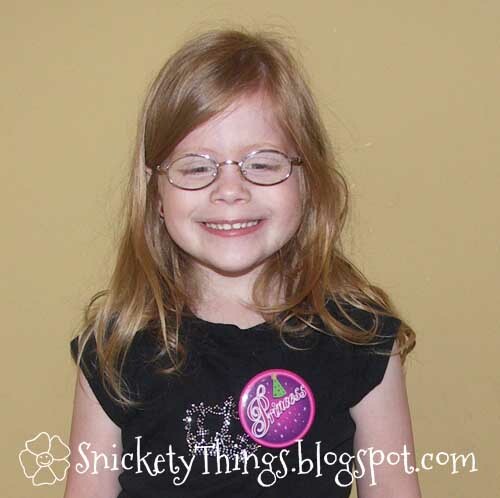 If there was any question at this point on whether my daughter was upset about her glasses, this book erased them See, she loves Fancy Nancy as you can read about here and here. 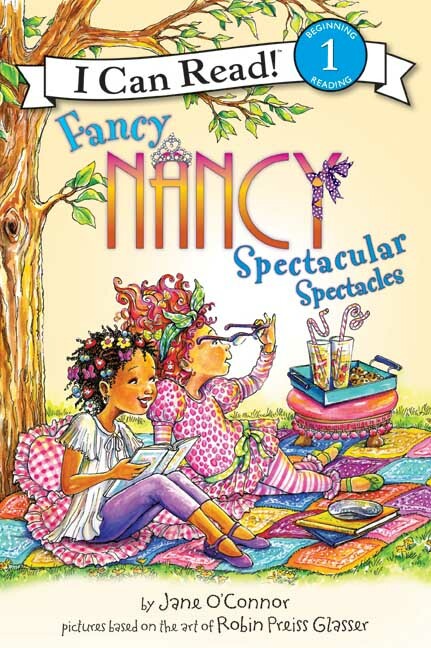 In this book Nancy is jealous of her friend Bree because Bree has new glasses. 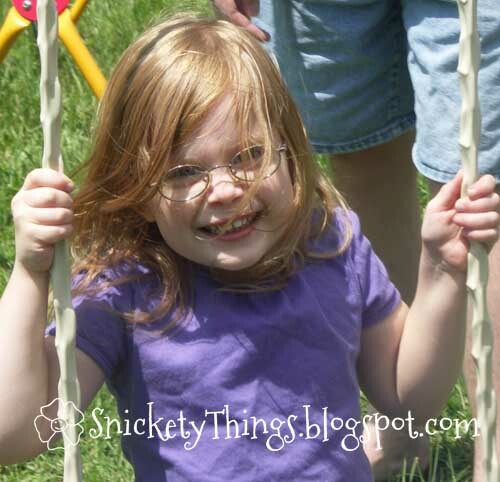 I think it made my daughter's day to think Fancy Nancy wanted to wear glasses. The Princes gives this two thumbs up. Boo says "Now I can have glasses." The Princess turned seven last week. 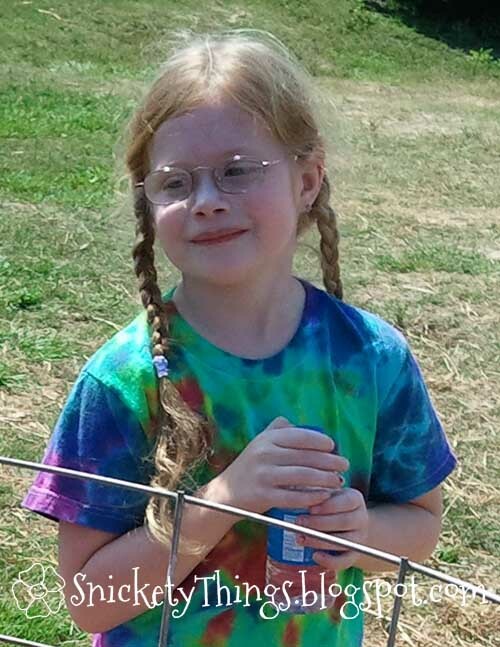 Here she is last Friday on her school field trip. She has now been wearing her glasses for five years. What great books! 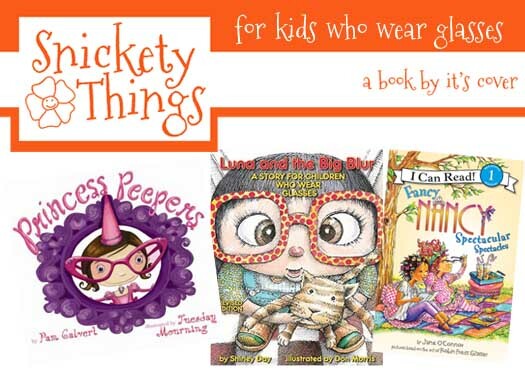 I have a daughter who wears glasses and one that should...Maybe I need to read these books to her!! I'm glad you like them Jenny! Like I said, they are good for any age. 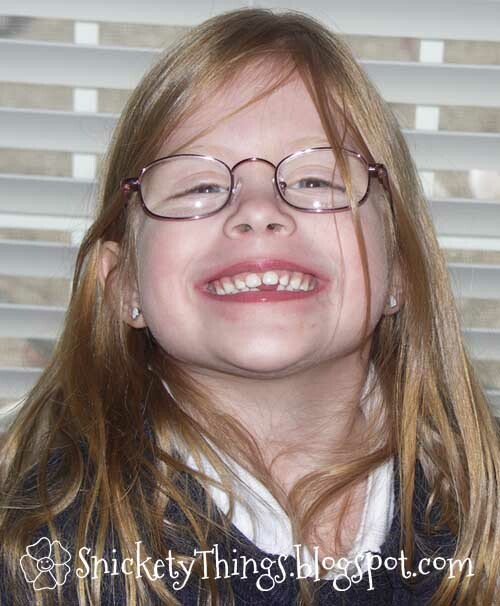 I think your daughter looks adorable in her glasses. Children can be so mean and cruel to each other. My daughter was being picked on by a girl in her class a couple of years ago. We were very lucky though to have a great teacher who kept an eye out for her. I'm glad your daughter's teacher looked out for her. I'm not sure that my daughter ever told her teacher, but I know the assistant teacher knew to watch out for her. Thanks for stopping by Snickety Things, I hope you come again! Great information. Thanks. I'm pinning it to my "kid stuff" board. Glad you liked it. Feel free to pin any of the images except the ones of my kids. Or not... Sham I can't pin it, but I have listed the titles. You should be able to pin it. I was able to use the pin it button and pin it to mine. Thanks Renonda. I've been having some computer issues on my PC. I'll try again on my Mac.